Laos is a land still steeped in tradition where life in the small villages is simple. Laos has so much history and a myriad of stunning monasteries to include the royal city of Luang Prabang, where hundreds of Buddhist monks move about quietly in prayer. You will travel through some of the most stunning mountain scenery you will find in South East Asia, with plenty of opportunities to stop off at the various Khmu and H&apos;mong villages along the way. Finish off your tour at the Pak Ou Caves, two linked caves crammed with thousands of gold lacquered Buddha statues of various shapes and sizes left by pilgrims. On arrival in Vientiane, you will be met and transferred to your hotel.Time permitting, your half day city tour enables us to see the major temples of Vientiane including the oldest, Wat Sisaket, a temple of thousands of miniature Buddha statues, and the former royal temple of Wat Prakeo, which previously housed the famous Emerald Buddha Image. We also visit Laos national icon, That Luang Stupa, and we stop to take some pictures of the imposing Patuxay Monument, which is Vientiane&apos;s own Arc de Triomphe. Following the morning at leisure, you will be transferred to the airport for your flight up to Udomxay.Here we have the chance to visit the intriguing Pra Xack Kham Temple with its sacred Buddha image. The 400 years old legendary statue is said to have many supernatural powers, and is widely worshipped among the faithful local Buddhists. We stop in Muang La, famous for its natural hot springs for the night.No activities are planned for the rest of the day so you can stroll around the village or just relax at the riverside retreat enjoying a massage or some time in the hot springs. Today we explore the local area and undertake an easy trek around the beautiful surrounding countryside visiting the numerous ethnic hill tribes that reside around the area.The evening can be spent back at the resort relaxing in the natural hot springs, taking a traditional massage and enjoying the excellent local Lao cuisine in the restaurant. Todays drive south takes us through some of the most stunning mountain scenery you will find in South East Asia, with plenty of opportunities to stop off at the various Khmu and H&apos;mong villages along the way.We shall reach Luang Prabang by mid afternoon, where you have the rest of the day to relax and take in the enchanting city.You may wish to spend the evening exploring the local night market. Your full day city tour begins after breakfast, with a visit to the Royal Palace Museum, which hosts a range of interesting artifacts. We then enjoy a short-guided tour seeing the city&apos;s oldest temple of Wat Sene and the magnificent Wat Xiengthong with its roofs sweeping low to the ground, which represents classical Laotian architecture. 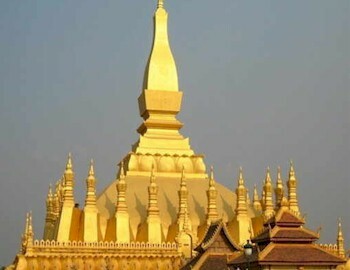 Today, we also visit the impressive stupa of Wat Visoun and the shrine of Wat Aham. Following lunch, we visit the Arts and Ethnology Centre to learn about Laos&apos; many ethnic cultures before we head out of town to see the weaving villages of Ban Xiengkhong and Ban Xienglek.We then return to the city for a visit to Wat Mai. We then climb up to the top of Mount Phousi for an enjoyable exploration of the sacred, gilded stupa as well as a panoramic view of the city at sunset and the Mekong River.The tour ends after a visit to the famous Night Market, where you can find a lovely selection of handmade textiles made by local and hilltribe people surrounding Luang Prabang. First we visit the morning Phousi Market, where you will see such diverse offerings as dried buffalo skin, local tea and saltpeter among the chickens, vegetables and hill-tribe weavings. Laos is also known for its traditional crafts, and today you will visit local villages of Lao ethnic minority groups at Ban Ouay, a Hmong village, Ban Ou a Laoloum village and Ban Thapene, a Khmu village.This then takes us to the beautiful Khuang Si Waterfall where you can cool off with a refreshing swim in the pools or walk along the forest trails. We then return to Luang Prabang. This afternoon, we embark on a cruise upstream on the Mekong River, which also gives us a breathtaking view of the tranquil countryside, before reaching the mysterious Pak Ou Caves, two linked caves crammed with thousands of gold lacquered Buddha statues of various shapes and sizes left by pilgrims.Along the way, we stop at the village of Ban Xanghai, where they make the local rice wine. On return, we disembark the boat to visit traditional villages, and continue taking a short drive to Ban Phanom, a village famous for its hand weaving.